A friend's Blogger/Blogspot blog is indexed incompletely by Google (i.e. many live posts don't show up in searches). I'm trying to help debug via Google Search Console, but it's comically confusing. Help! 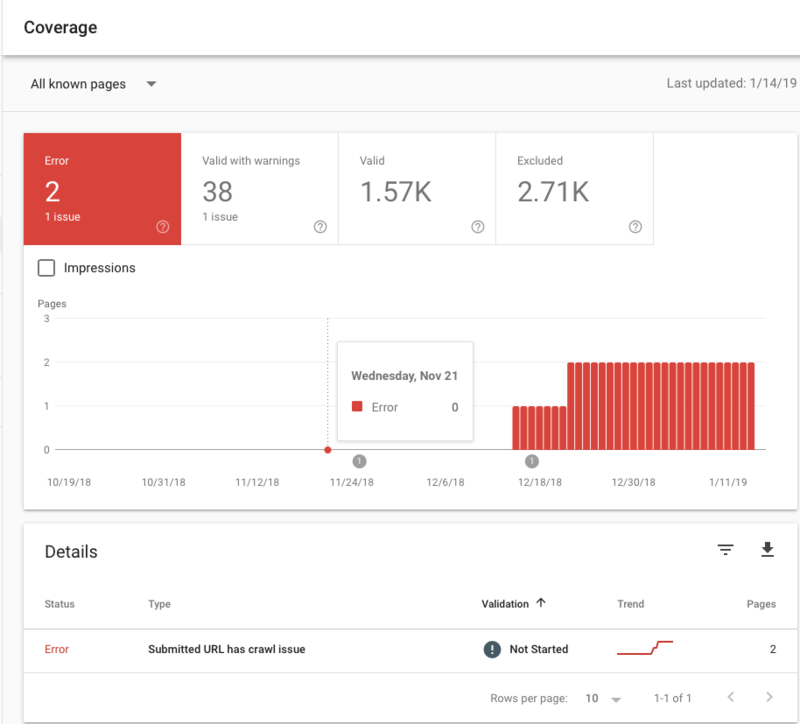 The URL's coverage report in Google Search Console shows "submitted URL has crawl issue" (screenshot), though Google definitely recognizes my friend as Owner. Blog has >2000 posts. Set-up is uncomplicated; just a standard Blogspot, mostly text. Can anyone guide remotely, or should this be a MeFi job? When you click the red "error" text at the bottom of the screen, what URLs does it say are problematic? Is one of them your sitemap or are they just random blog posts? Does it tell you what the problem was (like robots txt that says noindex or a server error)? At the top of your screenshot, if you click on the various headings it will show you the pages that have warnings or are excluded. I would view each of those reports & then for each listed page click the "fetch as google" link & then request indexing on the next page. google usually says what the error is. "submitted url has crawl issue" suggests that the url for the xml file is wrong and google cannot fetch it. perhaps there's a robots.txt entry blocking it or the url isn't correct, or perhaps the site had a brief outage? also that panel says that google has indexed 1.5k urls and excluded 2.7k urls for the site. try a google search like 'site:hereismysite.blogspot.com' to verify whether or not google actually has the site indexed. yeah, after a google search of 'inurl:atom.xml inurl:max inurl:start', if that's really a tilde, that's your error. my fee is one favorite and one best answer. I just returned, catching zippy in mid-monologue. A Lannister always repays his debts. Behold your proud badges, and bask in my thanks. One thing though. Should "max~results" be set above 1800, given that there are >2000 posts? start index is likely the first post no the xml will include, and max results is the total no, so you probably want start = 1 and max as big as your blog. you can view the xml directly to see what it contains.